Since the production, excerpts from the script won the Art of Protest Prize for Poetry from the Center of American Literary Studies at Penn State, to be presented by novelist and activist Sunil Yapa. In addition, the 12-woman cast has been invited to perform for the Annual Women’s History Conference at Sarah Lawrence College in Bronxville, NY as well as several local churches, schools and organizations. Recognizing the importance of this production, especially for young people, Director Bixler has agreed to stage it again on May 10 and 11 at 10 a.m. so that more students will be able to attend from Central Penn and local school districts. Classes in history, the humanities, English, psychology and criminal justice would all find material directly related to their content in Reclaiming My Time. Reserve seats for your class or encourage your students to get their tickets now. Like the other four shows, it is expected to sell out. Reclaiming My Time: An American Griot Project was written by Maria James-Thiaw and directed by Janet Bixler. This choreopoem, or play written in poetic form, was presented in partnership with The Harrisburg Chapter of the Links, a dynamic organization of professional African American women that has been dedicated to community service for 40 years. The soul food buffet and show benefiting the Links was underwritten by Highmark and the Links organized a talkback for the final show titled The Impact of Race and Gender Discrimination on Women’s Mental, Physical and Cultural Health. The talkback was led by Professor Thiaw and featured experts in healthcare, mental health and activism including Rev. Dr. Eleanor Moody-Shepherd, an awe-inspiring professor, minister and activist from Macon County Alabama who’s friend and mentor was Rev. Dr. Martin Luther King Jr. The choreopoem was composed by Thiaw, (penname Maria James-Thiaw) who has been a full-time professor at Central Penn College since 2004. She based the poems in the play on the stories gathered through an oral history research project. The women Thiaw interviewed were from different parts of the country, African American and white, Christian and Jewish, and between the ages of 65 and 95. The show is set in the round to embody the political ‘rap sessions’ that were common during the feminist movement of the 1960s and 70s. In these rap sessions women would sit in a circle and share stories, concerns, the personal and political. The purpose was to raise consciousness and this production does that as well, helping people to see what others have suffered so that we can enjoy the freedoms we have today. Lastly, the audiences raved about how professional the production was. Director Bixler is a multi-talented leader with a prestigious degree in theater from Emmerson and 30 years of experience in the field. Playwright James-Thiaw has published three poetry collections and has performed her work for 20 years around this country and in France. Three talented student leaders were part of the cast and many hard working, creative and tech savvy students made up the crew. 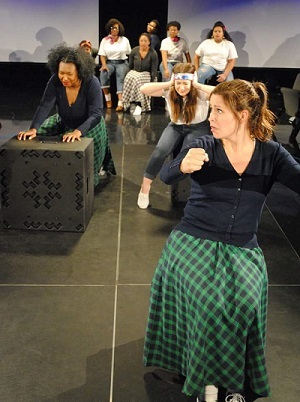 At the same time, the other nine cast members are professional artists, actors, public speakers and performers in our community who brought their “A” game to the Capital BlueCross Theatre because they saw the importance of this work. Yes, we should support this production because our students and faculty are involved, but we should also celebrate the fact that this production is a class act. Your last chance to see this production at the low cost of $7 general admission will be Thursday, May 10 and Friday, May 11. You’ll want to get that ticket today before it’s gone. Contact Janet Bixler to reserve your spot, and don’t forget to #StayWoke.